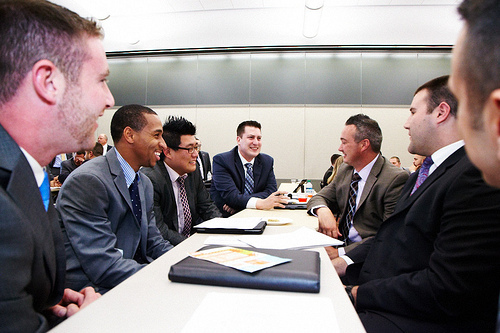 Business seminars are a great way to sharpen your skills, learn what’s new in the world of business, and to network. Just as we talked about with conferences last March, there is a right way and a wrong way to attend seminars. Come prepared. Look at the schedule ahead of time. Which speakers do you want to see? What topics are you interested in learning more about? Familiarize yourself with the speakers’ works – What papers or books have they written? What are their areas of expertise? Take notes. Our minds tend to wander even during the most interesting of conversations, so taking notes is the best way to stay focused. Bring your laptop or notebook, a highlighter and a few pens, and a pack of post-it notes. They will all come in handy. Review your notes. That way, if a question arises, you have a chance to ask the speaker directly. You will also be able to talk with other seminar attendees about the presentation and get their take on the subject. Ask questions. If there is something you don’t understand or want explained in more detail, don’t be afraid to ask during the Q&A portion of the presentation. If you want to have a discussion about the topic with the presenter, try to catch them after the presentation or some other time during the seminar. It’s important to remember to speak for the right reasons—it is more impressive to give a suggestion or ask an in-depth question than to try and pick out flaws in a presentation. Take it all in before applying. Don’t try to overhaul your business by next Monday. It’s okay to use some of the new ideas and materials right away, but it’s best for you to sit down with your business associates and plan a course of action incorporating the new ideas in a way that’s right for your business. Travel. Travelling seems to be pretty obvious, but there are a few things to keep in mind when attending a seminar that is out of state (or even out of town). When travelling a longer distance, try to arrive the day before the seminar begins just in case you run into delays. Make sure you have a hotel room before arriving to the city. If you fly in, check if the hotel offers a service to take you to and from the seminar. If not, ask the front desk to call a taxi for you. In next week’s blog post, we will talk about presenting at a seminar and offer some tips for giving the best presentation possible. Do you have any favorite tips or recommendations for making the most of a business seminar? Let us know on Twitter or LinkedIn–we’d love to hear your thoughts!